The legendary Peter Brook, ‘our greatest living theatre director’ (The Independent), will join the Young Vic’s Artistic Director David Lan to discuss his new book Tip of the Tongue: Reflections on Language and Meaning and his remarkable career on Wednesday 13 September. Peter Brook by Régis d’Audeville. In Tip of the Tongue, Peter Brook takes a charming, playful and wise look at topics such as the subtle, telling differences between French and English and the many levels on which we can appreciate the works of Shakespeare. Brook also revisits his seminal concept of the ’empty space’, considering how theatre – and the world – have changed over the course of his life. After the talk and audience Q&A session, Peter will sign copies of his new book. Following the book signing, there will be a special screening of The Tightrope (2012). In this revealing behind-the-scenes documentary, director Simon Brook – Peter’s son – takes us into the rehearsal room to witness Brook’s inspiring, powerful and intimate rehearsal process. An evening with Peter Brook will take place at 6pm in the Maria studio at the Young Vic Theatre on Wednesday 13 September. Tickets are available to book here. Tip of the Tongue: Reflections on Language and Meaning by Peter Brook is available to buy from nickhernbooks.co.uk. Our new podcast series, Off Book, is now available to stream and download from Soundcloud and iTunes. Each episode will feature an interview with one of the exciting artists who have visited us recently. Our first episode is with legendary director Peter Brook, which was recorded in Feb 2016 whilst Battlefield was on in the Main House. Our conversations bring to light people’s first experiences with the arts and theatre, how their background has informed the work they produce today and how it has developed throughout their career. Make sure to subscribe on either Soundcloud or iTunes to hear our latest episodes as they’re released. Battlefield at the Young Vic. Photo by Simon Annand. The internationally renowned team of Peter Brook, Marie-Hélène Estienne and Jean-Claude Carrière together revisit the great Indian epic the Mahabharata, 30 years after Brook’s legendary production took world theatre by storm. Read the fantastic reviews of Battlefield below and click here to see the audience response so far. Battlefield plays at the Young Vic until 27 February 2016. Book now. Peter Brook at Theatre des Bouffes du Nord. Photo by Simon Annand. We spoke to legendary theatre director Peter Brook in Paris at the Bouffes Du Nord ahead of the London premiere of Battlefield at the Young Vic. Theatre is a process. In a process, something is moving and developing every day, getting a bit better, maybe getting a little farther. Over the years people have asked the question: “When you do a play, do you think you’re helping to change the world?” I say: “My god no!”. But I know that when you’ve got a group of ten actors, however much on the first day they’re different, you have a common aim and it is immediate. It’s like a football team because when it comes to the match, nobody can think of anything but the immediate. Something is moving and developing every day. This little world is changing. Rehearsal time is always short but the pressure brings intensity, which in turn brings everyone nearer to one another. If a group of actors have worked together and they have become a whole, they know that with their story which they are longing to share, they can’t exist without an audience. And they know that time is limited. When I started working all we had was just three weeks and I fought and fought until we could bring it up to eight weeks. I think for A Midsummer Night’s Dream, we got ten weeks out of Stratford, and then when we did the Mahabharata in our own theatre, on our own conditions, we could take ten years. What’s interesting is that there is no such thing as a bad audience. The more diverse, the bigger the mixture, the better the audience. Gradually they come to what for us is the test. The audience is won. We have to go on preparing, building, sharing, until a point when that whole group of people who have each come off the street with their own preoccupations suddenly are touched. And that’s a mysterious thing. For a moment, they and the performers have become one. And that for us is the only real test – we’re delighted if people applaud, it’s natural – but if before the applause there is that moment of silence, that is the ultimate reward. The Bouffe du Nord, Paris. June 2015. Battlefield runs at the YV from 3 – 27 Feb. Click here to watch the video of Peter Brook in conversation and head to our Facebook page for a sneak peek at the company in rehearsal. How do you explore the inner workings of the mind on stage? To create theatre based on one of our more imprecise faculties, memory, might seem a bit like trying to make a painting of the sky, or compose a symphony based on silence. In devising The Valley of Astonishment Peter Brook and Marie-Hélène Estienne have, however, had an ample dose of the very component that gives memory its shape: time. 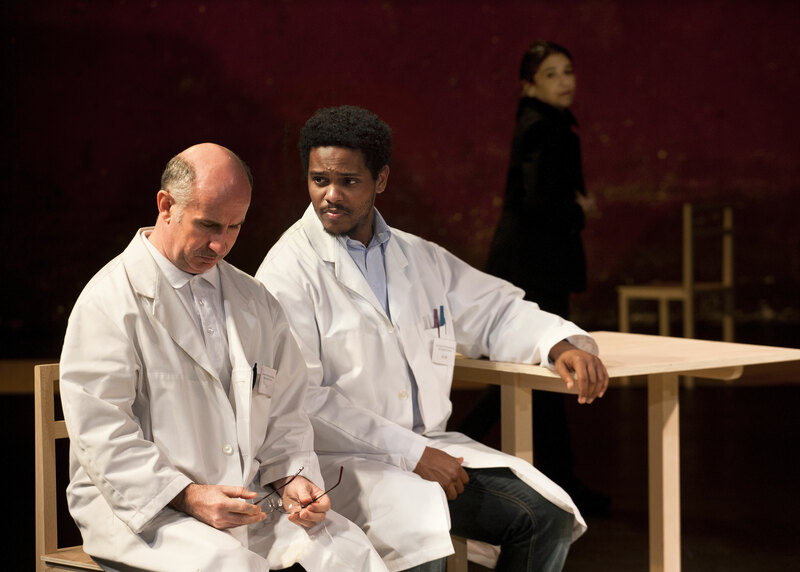 Some seeing this new show might recall seeing just over twenty years ago a wonderful play from the Bouffes du Nord, also exploring the mind, called The Man Who. It was inspired by neurologist Oliver Sacks’s 1985 book, The Man Who Mistook His Wife for a Hat. That book’s, and the play’s, subject was individuals with extraordinary mental conditions, more physical than psychological, in which their brains played debilitating tricks on them. The eponymous man who mistook his wife for a hat was afflicted with visual agnosia, able to identify familiar objects only through the music with which he associated them. That quiet play was the opposite of Peter Brook’s tumultuous dramatisation of the Indian epic, The Mahabharata, premiered in southern France in 1985, and first staged in English in Glasgow two and a half years later. Yet The Man Who was, like the ten-years-gestated Mahabharata – and like so much of Peter’s theatre – minted from extensive research and concentrated hours of reading, discussion and improvisation. As is The Valley of Astonishment. None other than the late Harold Pinter had handed Peter a copy, probably in the late 1970s, of Sacks’s book Awakenings (1973), about patients returning to normal life after decades in a strange state of sleeping sickness that struck after the First World War. “This is remarkable, you must read it,” Peter remembers Pinter saying. (Pinter also wrote a play, A Kind of Alaska, inspired by Awakenings. The Robert de Niro-Robin Williams film version of the book appeared in 1990.) Peter also managed, with his legendary persuasiveness, to get Sacks to consult with his Paris troupe over the twelve months or so while The Man Who was put together. Ideas had taken root and a process begun. Nothing of Peter Brook’s ever arrives ready-made. With a mind that still teems with familiarising metaphors, he likens his work to what you do in the kitchen. A fair guess is that Peter has been thinking about how to “stage the brain” for over thirty years. On the way to The Valley of Astonishment, there have of course been famous theatrical forays into South Africa (The Suit and Sizwe Banzi is Dead), Shakespeare (The Tempest and Hamlet), Mozart (Don Giovanni and The Magic Flute) and Mali (Tierno Bokar). But a crucial staging post on the road to tonight was a 1998 production seen neither in English nor in Britain, Je suis un phénomène (“I am a phenomenon”). In this warm portrayal of Solomon Shereshevsky, a Russian journalist active in the 1920s and 1930s (played sixteen years ago by Maurice Bénichou), Peter’s investigations into neurology took an exuberant turn. Shereshevsky could, simply, remember everything; his story was from The Mind of a Mnemonist (1968), by neuropsychologist Alexander Luria (a hero, as it happens, for Oliver Sacks). Shereshevsky’s life as a mnemonist-in-public resembled, as Je suis un phénomène beautifully displayed, a circus. “He ended,” says Peter, “a very unhappy man. He got caught up in performing, and developed a greater and greater terror of each performance not being up to standard. Just like an old actor, he felt such suffering if it wasn’t a good performance, and such relief if it was.” In Je suis un phénomène, Shereshevsky became a victim of his own freakishness: the play’s exploration of a vast memory hinted finally at human tragedy – but with no melodrama and certainly no overstatement. It is thus to reveal no great secret that a certain amount of the 1998 French play turns up in the 2014 English one. Importantly, The Valley of Astonishment is lighter (in all senses), yet more diffuse than its predecessor, perhaps even more compellingly theatrical – and funnier. Je suis un phénomène was in fact originally intended to be a film; in its journey to The Valley of Astonishment, Peter attributes much of the re-transformation to his close collaborator. 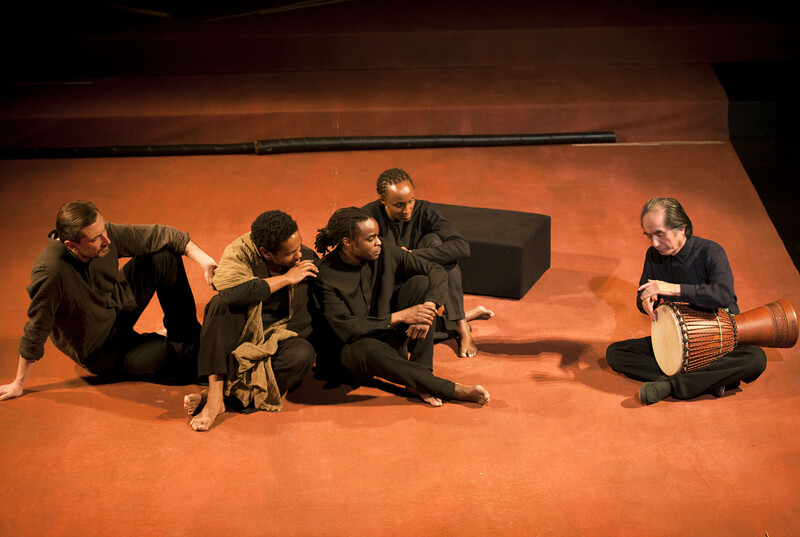 The Valley of Astonishment opens at the Young Vic on 20 June and runs until 12 July. 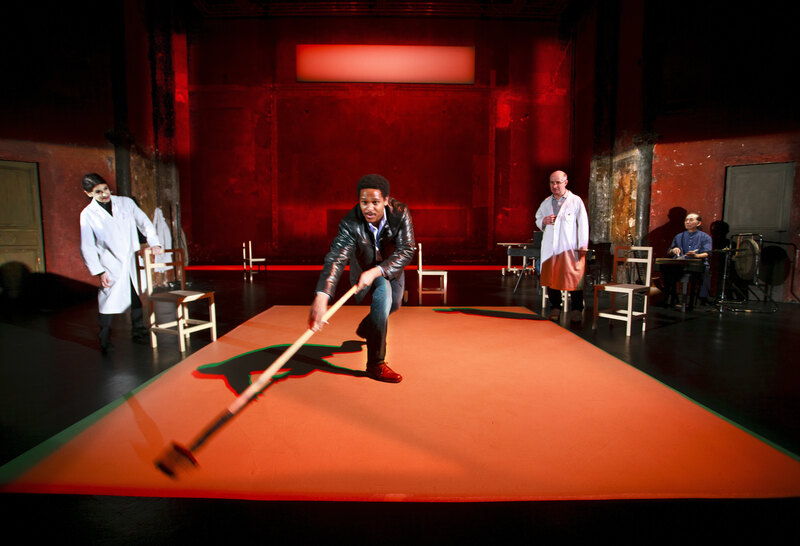 Click here to see pictures from the show or visit http://www.youngvic.org to book tickets. You can read James’ interview with Peter Brook in the programme for The Valley of Astonishment, available before each performance for £3. If we go to the theatre, it’s because we want to be surprised, even amazed. And yet we can only be concerned if we can feel a strong link with ourselves. So, these two opposite elements have to come together – the familiar and the extraordinary. In ‘The Man Who’, our first adventure into the labyrinths of the brain, we met neurological cases who in the past had been conveniently written off as ‘mad’. Our first surprise was to encounter beings like ourselves, whose condition made their behaviour totally unpredictable. Painful to watch, though often very comic, they were always touching – deeply human. In ‘The Valley of Astonishment’, once again, we are exploring the brain. We will take the spectator into new and unknown territories through people whose secret lives are so intense, so drenched in music, colour, taste, images and memories that they can pass any instant from paradise to hell and back again. We link this to the great Persian poem ‘The Conference of the Birds’. Thirty birds in their quest for a King have to cross seven valleys of mounting suffering and discovery. An amazing series of anecdotes from the life of the time with poetry and humour brings their story into sharp relief. So as we explore the mountains and the valleys of the brain we will reach the valley of astonishment. As we go forward with our feet firmly on the ground, each step takes us further into the unknown. Today we unveiled our new brand new 2014 Season at the Young Vic and we’re really excited about it. Kicking things off will be Samuel Beckett’s Happy Days directed by Natalie Abrahami. Olivier award-winning actress Juliet Stevenson will take on the role of Winnie, alongside David Beames. Following that, Ivo van Hove makes his UK debut following huge success in Europe and beyond, as he directs one of Arthur Miller’s greatest plays, A View from the Bridge. Peter Brook and Marie-Hélène Estienne join forces once again as they return to the Young Vic following their international hit The Suit last year; this season they direct brand new play The Valley of Astonishment. In Tennessee Williams’ A Streetcar Named Desire, star of stage and screen Gillian Anderson returns to London to play the notorious Blanche DuBois, while Critics’ Circle award-winner Benedict Andrews directs. A new version of Anton Chekhov’s The Cherry Orchard by Simon Stephens will be directed by Katie Mitchell as she makes her much anticipated return to the Young Vic. Inventive theatre company 1927’s new show Golem is set to blend original animation with live performance in an exploration of what happens when mankind and machines become inextricably intertwined. We are also thrilled to announce that following smash-hit runs at the Young Vic and the West End, Carrie Cracknell’s sensational A Doll’s House will be making its way to New York’s BAM in early 2014. As well as all of this excitement set for 2014, today we announced that due to phenomenal demand for tickets even before it’s opened, 12-time Tony Award nominated The Scottsboro Boys has been extended at the Young Vic until 21 December. Fancy an alternative Christmas show this festive season? Inspired by the real-life love story between Mat Fraser and Julie Atlas Muz, Improbable’s Phelim McDermott directs a radically remixed and adult-only version of classic fairy tale, Beauty and the Beast. Young Vic Friends get priority booking, so if you can’t wait and want to book your tickets for our brilliant new season now then become a Friend today from just £35. As a Friend you’ll get other exclusive discounts and benefits on top of priority booking too. If you want to find out more, call 020 7922 2922 or click here. Public booking for our new season opens on Monday 7 October at 10am.